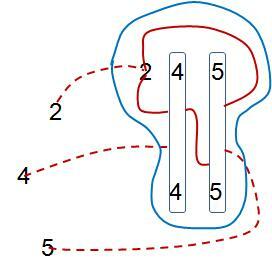 This post explains how an Almost Locked Set, an ALS, can be a node in an AIC, providing a slink between two winks connecting candidates of different numbers. 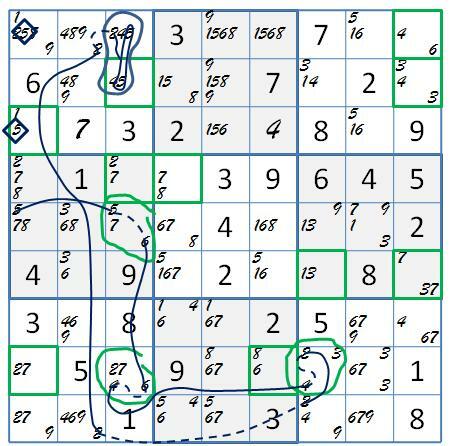 In this blog the ALS was first applied in the Sysudoku version of Sue de Coq. ALS is a set of n mutually visible cells containing n + 1 numbers. Earlier, in Subsets by Suset , it was noted that a scratchpad algorithm for locked sets also uncovers every ALS in a unit. Beginners can use this simple algorithm to identify the ALS of a unit until it becomes second nature. Within a unit, all candidates of any number are a group. In an ALS all but one of these groups is true. When all candidates of a number are removed from an ALS, the remaining numbers form a locked set. A grouped wink from an outside candidate into the ALS signifies just such a removal, if that candidate proves true. The locked set means that the remaining candidates of each remaining number become a true group. This fact can be marked as a grouped slink between the “removal” group and all remaining groups. A grouped wink to an outside candidate from any of these groups completes the passage of the AIC through the ALS. In this schematic , outside candidate X sees all X’s in the ALS, and another outside candidate Z sees all Z’s allowing two grouped winks into the ALS. The group-to-group slink that is always there between the X group and the Z group carries the chain from X to Z. 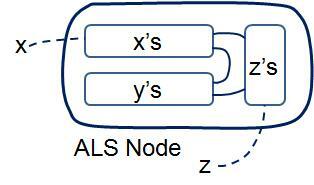 Here is a good illustration of the ALS node, from Andrew Stuart’s The Logic of Sudoku. 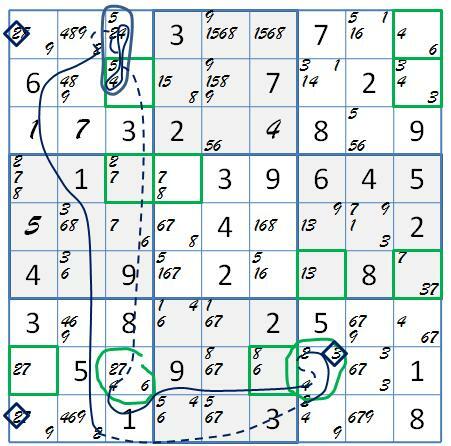 Andrew’s example, Figure 30.1, is translated into Systematic Sudoku marking on the grid. The ALS is a simple one, with 3 number groups, one of them, a single candidate. The ALS node completes an AIC that confirms 7r3c2. If one of the grouped links into an ALS is a grouped slink, and the AIC is completed between that candidate and an entering grouped wink, then the slink entry group is confirmed as one of the true number groups. That means that other outside candidates that see all candidates in this group are eliminated. How do you apply the ALS AIC node to AIC construction? I’d say when the music stops on the AIC chain you are building, and you see the chain or loop you would like to complete. Look for an ALS to make the connection. Looking for ALS first, then exploring the chains emerging from its groups is not going to be a good use of your time at this point of your order of battle, because the numbers of ALS is very high compared to related AIC. Although not intended for the purpose, Stuart’s 30.1 example reveals two more very interesting uses for the internal slinks of an ALS. After marking the new 7 and 4-clues from the above, I added AIC hinges and tried to build something using the 2-to-5 internal slink of the ALS. I got an AIC grouped ANL. Either the 5-group of the ALS, or r5c1 contains a true 5, so two 5’s clean out their desks and leave the building. Now the 5-group of the ALS is dormant, since one of the 5-candidates must be true. The ALS remains active, however, with 2- and 4-groups. This time the ALS enables a nice loop. The relevant AIC hinges are left in. an unusual, but simple AIC almost nice loop brings the puzzle into collapse. Note where the eliminating winks come from. Hmmm! Next time, we take up the most common role of the ALS, the generation of toxic sets. This entry was posted in Advanced Solving and tagged AIC, AIC nice loop, ALS AIC node, ALS aided AIC, ALS node. Bookmark the permalink. Thanks for tuning in, Edney. You’re welcome to comment on any of he material, and to subscribe to the feed. I’m originally from N.C.
certainly like what you are stating and the best way during which you assert it.